Egypt experienced periods of heavy rainfall in the millennia that marked the post-glacial northward shift of the temperate zone. 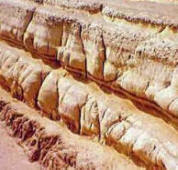 This period lasted from about 10,000 to 5000 BCE and by its end the Sahara had turned from green savanna into a desert. Orthodox archaeologists refused even to consider West's hypothesis. But in 1990 West persuaded Robert M. Schoch, a geologist at Boston University, to examine the question. Curious, Schoch agreed and the two visited Giza in June 1990. On a second trip to Giza in April 1991, West and Schoch brought Thomas Dobecki, a geophysicist from Houston, Texas, to carry out a seismic survey of the enclosure foundations to determine whether the underlying rock showed evidence of precipitation damage. The degree of subsurface weathering could be measured by bouncing sound waves off of deeper layers of rock. With the permission of the Egyptian Antiquities Organization, the team carried out sound-wave tests through the floor of the enclosure. Schoch and Dobecki discovered that the enclosure floor in front and alongside of the Sphinx had weathered to a depth of six to eight feet. They also discovered that the back of the enclosure had weathered only half as far. Schoch agreed that the floor behind the Sphinx had been excavated during the Old Kingdom but he concluded that the sides and front of the monument were twice as old. Assuming a linear rate of weathering, Schoch estimated the date of the Sphinx and most of the enclosure to between 5000 and 7000 BCE, far earlier than the date of 2500 assumed by archaeology. Schoch noted that weathering could have been non-linear, slowing as it got deeper because of the increasing mass of rock overhead. On this assumption, the Sphinx could have been significantly older than 7000 BCE. Egyptologists dated the Sphinx to Khafra from several kinds of evidence. A stela from the New Kingdom reign of Thutmose IV (1401-1391 BCE) stands in front of the monument, and an inscription that has since flaked off contained the first syllable of Khafra's name. Statues of Khafra found in his Valley Temple also seemed to associate the complex with Khafra, and the Sphinx head was assumed to be his as well. Finally, the causeway from Khafra's pyramid was built into the Khafra Valley Temple. To the problem of archaeological context for an earlier Sphinx, Schoch replied that urban centers had existed in the eastern Mediterranean at Catal Huyuk from the seventh millennium and at Jericho from the ninth millennium BCE. At Jericho there were large stone walls and a thirty foot tower. No such settlement had been found in Egypt itself but clearly there needs to be a better concept accepted of human knowledge before the Bible dating of 4000 BC. If erosion by water is your choice, it has to be rainwater over a long period. By the time of Khafre, rainfall in Egypt was very similar to its current level, and could not possibly account for the deep erosion on the surface of the Sphinx. Egypt's last time period where there was a significant amount of rainfall ended during the 3rd millennium BC. Shoch claims that the amount of water erosion they feel that the Sphinx has experienced indicates a construction date no later than the 6th millennium BC or 5th millennium BC.